NaCl. Salt is life. Salt seasons and preserves. In Rome soldiers were paid in salt. The word “salary” is derived from salt. When someone is good at what they do we say that they are worth their weight in salt. Not that long ago salt was treasured. It’s only in the past 100 years or so that salt has been widely available. Whether you’re pickling, smoking or drying your food you’ll be relying on salt to work its magic. Salt keeps food from going bad. One time I cured a pork tenderloin with salt and spices and hanging it in a cold closet. I made kim chi and sauerkraut a couple of times. No vinegar. It’s all lacto fermentation due to salt working its magic. So it’s important that you have enough salt stored to last you through whatever you think may happen. Some areas have salt mines deep under ground. The remnants of ancient oceans. There are a many different types of salt. I like kosher salt for most uses and some flaky salt to finish things with. The flaky salt adds some nice texture on top of foods. Then there’s pink salt for curing foods and rock salt to met the ice or make ice cream. I think sea salt is extra good because of all the good stuff in the sea! I don’t run ads or get money for clicks or anything like that. When I give my opinion, good or bad, it’s based on my own experience untainted by commerce, or any great understanding of the subject matter at hand. That’s the great thing about opinion. 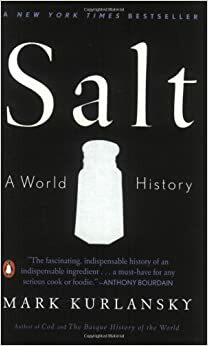 A friend loaned me the book, Salt: A World History. I really enjoyed reading it and think it would make some good winter reading so go fetch it from your local athenaeum. Anyways, salt can be one of those things that’s tough to find in times of crisis. And like batteries, flashlights, lighters and many other things tough to make at home. Unless of course you live near a salt deposit or the ocean. I live near the ocean and being one curious individual I took it upon myself to do some experimentation. I wanted an evaporation table. Something that could hold seawater so it could evaporate under the sun. One thing I’m good at is creative solutions using junk that is laying around. Who needs a screw when you have a nail or a hammer when you have the side of an adjustable wrench? There was an old table or sorts sitting out back unused. First step I tacked on some strapping that was also laying around out back looking for something to do and tacked it all around the sides of the table to form a sort of raised edge maybe 2″ high. 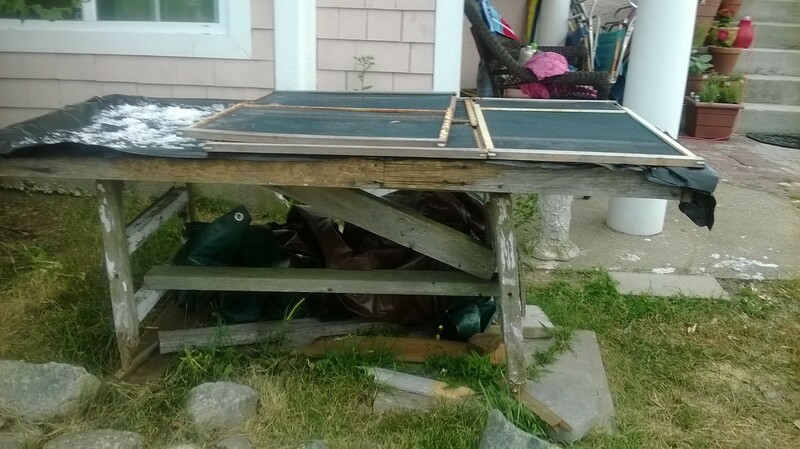 Next, I bought some black plastic sheeting and laid it inside of my table, brought it up over the edges and tacked it down. 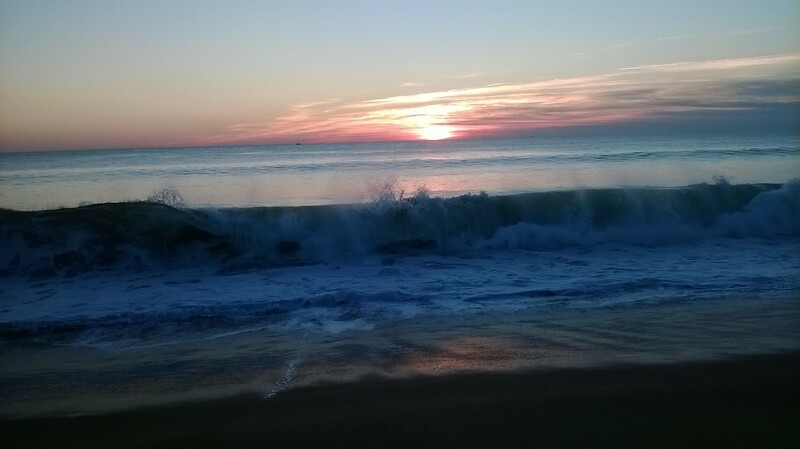 I walk down the end of my street to the beach and filled up a clean 5 gallon bucket with some water being careful to go out a bit to get good clean water. I’d also suggest only gathering water when the wind is blowing offshore so any skunky junk is blown away from your area of collection. I poured the seawater into the table. I happened to have a bunch of adjustable metal screens also laying around in the great “out back” so I covered the table with those to minimize any bugs and bird droppings. 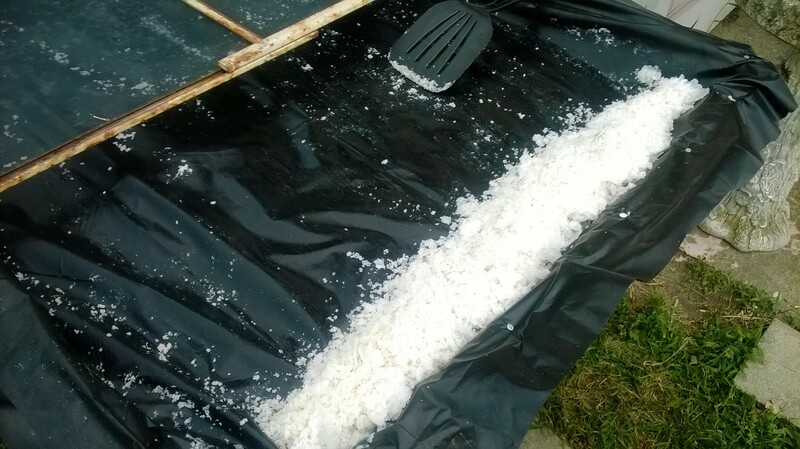 After a few sunny days the water evaporated and the table was lined with beautiful sea salt. This was my second summer doing it. Last year I filled some fancy jars with the sea salt, decorated them a bit and gave them out for Christmas presents. So what I’ve learned from being a two season salt farmer. Salt farmers like low humidity, sunshine, long days and drying winds. I’m right on the coast of New England. Our summers are short and humid. It still works as you’ll see below. Originally I just had the black plastic on the wood of the table. I thought to myself if I can add some mass under the black plastic it will hold the heat of the sun better and evaporate the water faster. 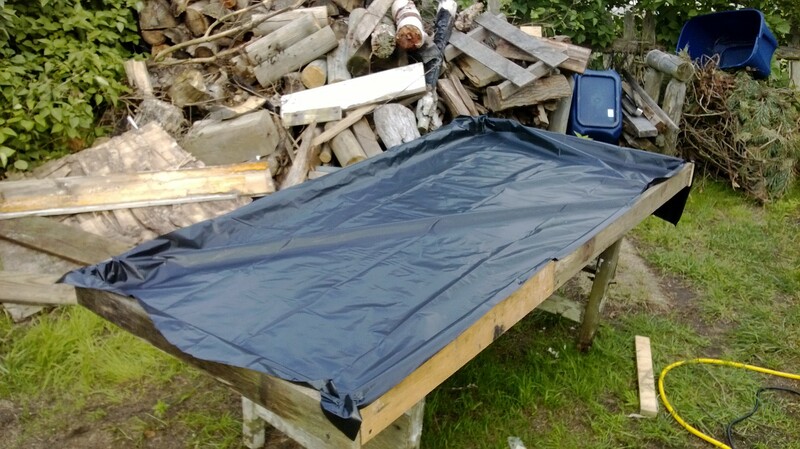 So at the beginning of this year I added maybe 1/2″ of sand on top of the plastic from last year and than relined the table with fresh black plastic sheeting. The addition of just that little amount of geothermal mass has really speeded evaporation along. You’re better off pouring in a smaller amount of water, maybe 1-2 gallons at a time and as it evaporates adding small amounts. It seems like it takes forever when I poured a full 5 gallon bucket in all at once. 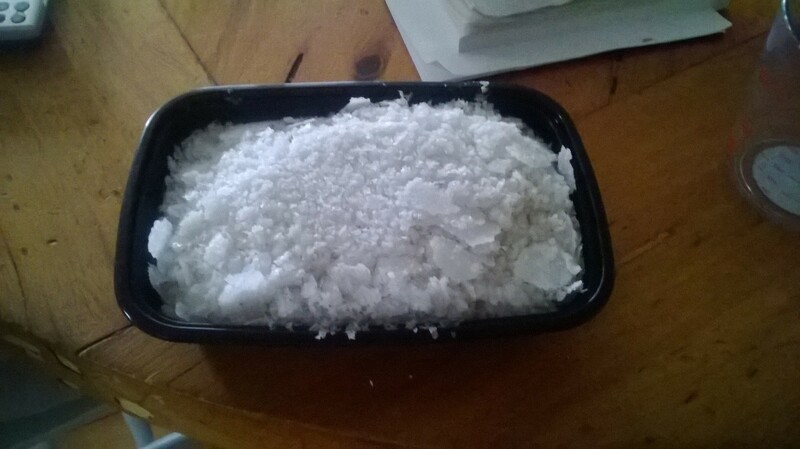 An old credit card worked well for me to scrape the salt into a pile for harvesting without ripping the black plastic. I tarped the table during rainy weather but the salt still got dirty. If you know rain is coming don’t get greedy. Stop adding water to the table. Let it dry up and collect what you have. Don’t get greedy. Harvest what accumulates before it gets dirty. 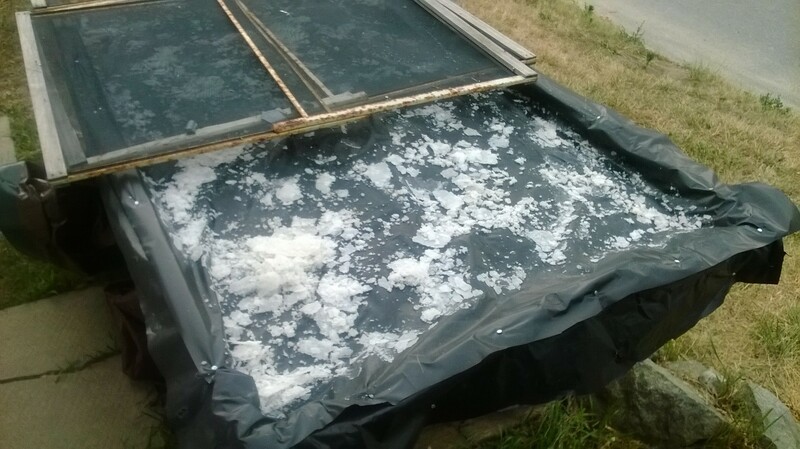 In my area it seemed like it was best to collect the salt after 7-10 gallons evaporated. Clean the table after every harvest. For some reason the salt this year tasted much stronger than last year’s. I figure that I get about 21-28 ounces of beautiful flaky sea salt for every 8-10 gallons evaporated. This stuff, well I don’t sell mine, sells for a lot of money! I’ve seen tiny amounts of gourmet labeled sea salt for sale for $10+! This is the table all assembled. You can see the screens on the table. The screens pulled to one side. Pretty good amount out of 8 gallons. The salt all pushed to one side. A takeout food container brimming with beautiful, white, tasty, sea salt! 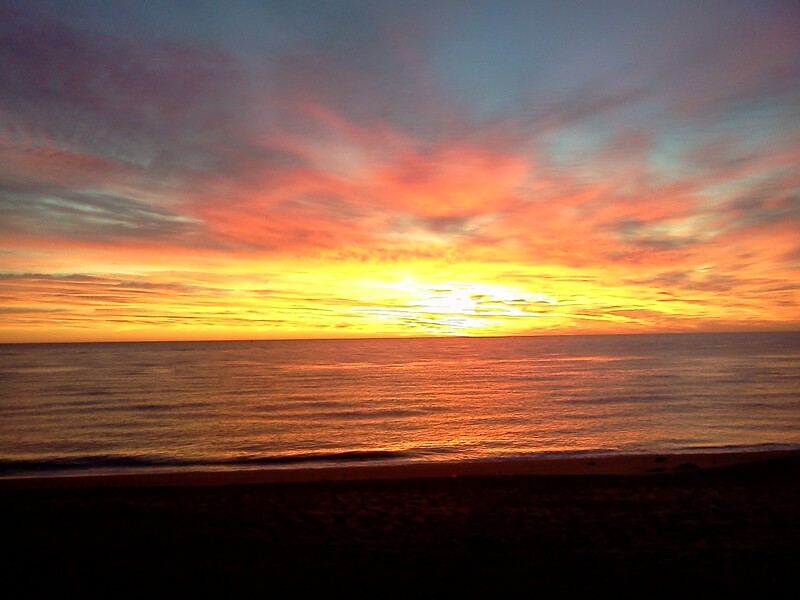 Taken with my cell phone camera. You are currently browsing the Abraham's Blog blog archives for November, 2014.